Looking for Skip Hire in Chingford E4? 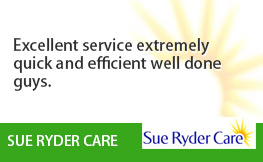 We may be known for our services in Essex, but did you know we also serve East London too? 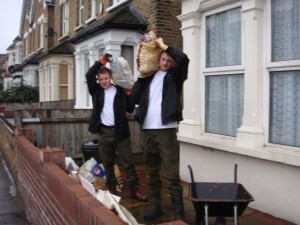 If you’re seeking skip hire in Chingford you should call us now! It doesn’t matter if you’re revamping the garden, having building work done or simply need to get rid of some household junk, getting a skip to you whenever you want it is no problem. 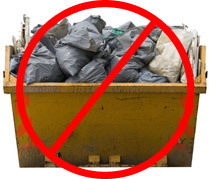 Hiring a skip doesn’t need to be complicated nor expensive. At Away With It, we tailor everything to your requirements so that you are wholeheartedly satisfied. Available 7am until 11;30pm, 7 days a week, we are able to provide skip hire when it best suits you, even arranging same-day quotes and services if you’d be happy with that. 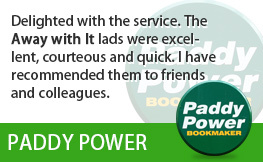 We have been serving the citizens of Chingford for a number of years and we see countless repeat customers who were impressed with our professionality and affordability the first-time round. Our rapid and traditional skip hire service is a popular choice. You can have one of our spacious skips for a time frame that you decide. This gives you the scope to remove rubbish at your own pace and not feel rushed. 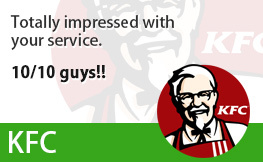 On the other hand, our waste disposal service is a favourite of others. With this option, you won’t need to lift a finger as one of our two-man teams will arrive in one of our licensed vehicles and load it with anything you want rid of. Regardless of which service you choose, you can always rest assured that our solution will be much friendlier on your bank account than others. What sets us apart is that we charge by the volume of waste we remove as opposed to ‘loads’. 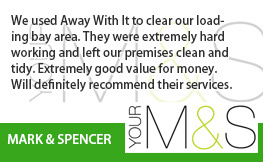 We know you need a Chingford skip hire company you can rely on. That’s why, at Away With It, we strive to continue building on the fantastic reputation we have earnt over the years. Thousands of customers have, even those in the midst of a stressful situation, have found our staff friendly, calming and efficient. Our job is to make everything as easy as possible for you. Our flexibility with times means you can completely tailor your skip hire solution to suit you. No longer will you have to take a day’s annual leave or pay for childcare to get a job done. You will never wait around for a skip or waste disposal team. Not only will you have a specific time and date, our driver will also give you a quick call when they are on their way to your property, just to let you know. 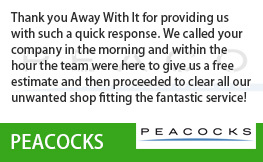 As a fully licensed and insured waste removal company you know you are in safe hands. We are a name you can rely on and supply Chingford with the best skip hire and waste removal services. Another bonus, we recycle 80% of what we remove and take our green approach very seriously. 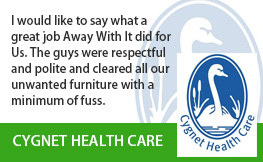 Call our friendly team today to find out how we can help and talk through your options. 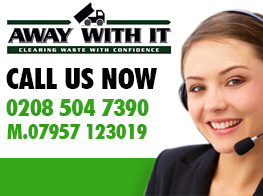 Simply call 0208 504 7390 and let us help you get that waste removed today.